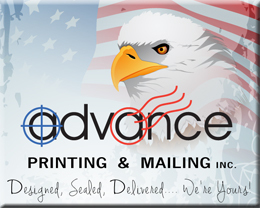 Direct Mail – Advance Printing and Mailing INC. Direct Mail is a form of marketing that is unique because it gets your printed advertising DIRECTLY in the hand of the potential end user! It is not the cheapest way to market, but it is VERY EFFECTIVE. What matters most in any advertising campaign is the Return On Investment or commonly referred to as ROI. Your profit is the bottom line! Direct mail has a proven success record and our testimonials are one way to see that our customers use direct mail advertising continually and ARE GETTING RESULTS continually. We do recommend setting up mail campaigns that are three months in duration at a minimum. We can help you set up a campaign starting with a survey to your current customers and using that information to design a marketing tool that will get results and then targeting a good list to use. Then we determine the number of pieces that will go out and the frequency this number is sent out. Together we come up with the best plan to start and then over time can be increased. It is proven using this method of advertising to repeat to your same public a minimum of 3 times in a three to six month period of time. They say that each recipient will only recognize your company after getting it the third time. Three times is the CHARM! We keep this in mind when setting up your campaign. Direct Addressing is a term that refers to printing an address directly on to a mail piece. This process replaces the affixing of the labels of old. It also speeds up the process and the quality of print. Our inkjet system is designed for high volume capacity. We can do a very small mailing up to thousands on our equipment with ease. We can add a permit or tag line to the mail piece if it has been left off on the original print for an extra small fee. We use delivery point barcodes with full service postage discounts. The savings in postage we can offer you most often pays for us to perform this service. Our expertise in maximizing your budget expense to potentially get you more customers is waiting to be tapped into by YOU!